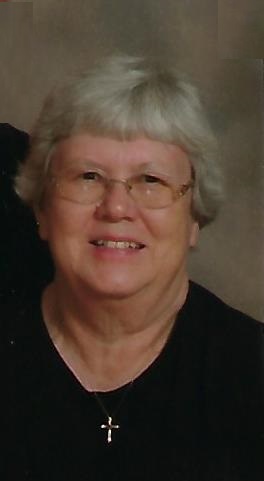 Mabel G. Weaver, 75, of New Athens, IL was called to her heavenly home by Our Lord and Savior Jesus Christ on January 20,2019. Surrounded by her caring husband, Gene, family, and her devoted dog April, Mabel succumbed to the complications of Alzheimer’s disease after a 4-year battle. She was born Mabel Gene Schaudt on September 24, 1943 to Louis and Esther, nee Fastenau, Schaudt of Percy, IL. Mabel was a graduate of St. Mark’s Lutheran School, Steeleville, IL Class of 1958, and Steeleville High School, Steeleville, IL Class of 1962. At St. Mark’s Lutheran Church, Steelville, IL on March 29, 1964, God blessed Mabel with a faithful and loving husband, Gene Dale Weaver of Steeleville, IL. For over 54 years, Our Lord blessed and guided them as husband and wife through the joys and thanksgiving, trials and tribulations of life. God granted Gene the strength to care for Mabel throughout these last four years as she was able to remain at home. Our Lord blessed Mabel and Gene with three children: Scott and wife Deb Weaver, Bloomington, IL; Robert and wife Jennifer Weaver, New Athens, IL; and Rhonda and husband Darin Bohn, Trenton, IL; 12 grandchildren: Kristin Weaver, Lexington, KY, Rachael Weaver and fiancé Brian Rohman, Bloomington, IL; Caitlin and husband JR Pflasterer, Shiloh, IL, George Weaver, New Athens, IL; John, Emma, Ella, Erica, Jacob, Jack, Jeffrey, and Joshua Bohn, Trenton, IL; and one great granddaughter Olivia Pflasterer, Shiloh, IL. Also surviving are sister and brother-in law Mildred and Lynn Robb, Steeleville, IL; brother Raymond Schaudt, Percy, IL; and sister-in-law and brother-in law Mary Lou and Leonard Mulholland, Coulterville, IL as well as cousins, nephews, nieces and friends. A life long LCMS Lutheran, Mabel renewed her baptismal vows by rite of confirmation at St. Mark’s Lutheran Church, Steeleville, IL on March 30, 1958. Since 1976, Mabel has been a faithful member of St. Paul’s Lutheran Church, New Athens, IL. Over the years, she was active in the Sunday school, women’s club, spaghetti suppers and other activities. In her later years, she was a regular at Saturday evening services. Mabel was a caring wife, mother – grand and great, and baby sitter. An avid fund raiser for the kids and grandkids schools and clubs, chauffer and attendee for music lessons, sporting events, band concerts, 4-H/FFA meetings and events, and many more. For her efforts, Mabel was made an Honorary Chapter Farmer, New Athens FFA Chapter. For 20 years, Mabel was a loyal worker for Siemens Manufacturing, New Athens, IL retiring in November 2014. She was known for her hard work, warm smile, extra coat and many crocheted hats, for she was always cold natured. Mabel has been and will be missed as the soft-spoken telephone link between family and relatives. Free of her earthly ailments, Mabel is reunited with the saints, family and friends, who have been called before, including her parents, Louis and Esther Schaudt, mother and father in law, Clarence and Alma Weaver, loving and kind aunt and uncle Louise and Rudy Haupt, and dear friend Leona Schickedanz. A special thank you to the staff of Family Hospice, Belleville, IL for the care, comfort, and support they have provided to Mabel, Gene, and the family since August. Memorials: St. Paul Lutheran Church in New Athens, IL or to the Clinton County Farm Bureau for the multi-purpose event center at the Clinton County Fairgrounds. Condolences to the family maybe expressed online at www.heilschuessler.com. Visitation; Friends may call from 4:30 to 8 p.m. Friday, January 25, 2018 at Heil-Schuessler Funeral Home in New Athens, IL and again from 9 to 11 a.m. on Saturday, January 26, 2019 at St. Paul Lutheran Church in New Athens, IL. So sorry for your loss. My thoughts and prayers are with your family. May you find peace and comfort with God. Scott and Robert, and fanily,I am so sorry for your loss. Your Mom was a very special lady. She knew how to always cheer me up. I am sorry I can’t be there right now but you are always in my prayers. She was a beautiful, caring lady. May God watch over her and your family. Sympathy goes to the family and friends – Mabel is in Heaven but we all are still stuck here. Who has the best deal?? So sorry for your lost. Prayers or family and you. Mike and Cheryl Schanuel and Bryanne.